LONDON, UK, January 9, 2014 (ENS) – The River Thames continues to rise in response to recent heavy rainfall, and communities in the south of England should be prepared for further flooding this week from groundwater and rivers, warns the UK Environment Agency. Following a week of torrential rains, strong winds, storm surges and high tides that have left seven dead and hundreds of homes inundated, further flooding is expected along the River Thames. The Environment Agency warns that water levels will continue to rise, even though The Met Office is forecasting light showers and drier weather into the weekend. But Environment Agency Chief Executive Paul Leinster has warned that government funding cuts to the agency will impact its ability to deal with flooding. 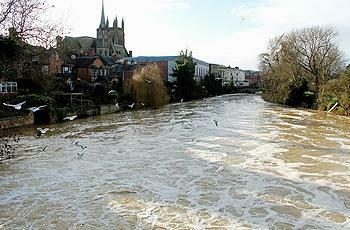 The Environment Agency’s budget is being cut by 15 percent over the next year. At least 550 staffers who work in flooding could lose their jobs as part of the government restructuring, according to figures obtained by “The ENDS Report,” an environmental policy magazine. MP Owen Paterson, who heads the Environment Agency’s Department for Environment, Food and Rural Affairs, or Defra, said last week that the agency “intends” to protect front-line flooding services from the cuts, but his past remarks have tagged Paterson as a climate change skeptic, and environmentalists are skeptical of his commitment to flood protection. “What’s more, the Environment Agency says investments in flood defences must increase to keep pace with climate change – yet the [Conservative/Liberal Democrat] Coalition [Government] has overseen a real-terms cut in spending on them,” Shrubsole said. Surprising many members of his own Conservative Party, Prime Minister Cameron Wednesday told Parliament he now believes climate change is responsible for the extreme rainfall and flooding afflicting the UK. Environmentalists are urging the government to reverse its plans to cut hundreds of jobs from the Environment Agency, the jobs of staffers who are working to defend the country from flooding. 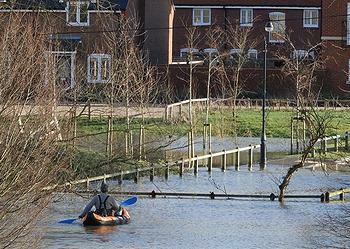 The Met Office predicts that 2014 will be among the top 10 hottest since recordkeeping began.